The “greatest mining camp on earth” built on “the richest hill in the world.” That hill, which has produced over two billion dollars worth of gold, silver, copper, and zinc, is literally honeycombed with drifts, winzes, and stopes that extend beneath the city. There are over 3,000 miles of workings, and shafts reach a depth of 4,000 feet. This immediate country was opened as a placer district in 1864. 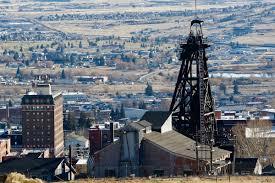 Later Butte became a quartz mining camp and successively opened silver, copper and zinc deposits. 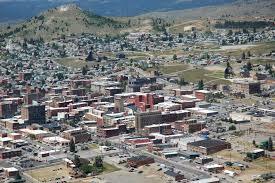 Butte has a most cosmopolitan population derived from the four corners of the world. She was a bold, unashamed, rootin, tootin’, hellroarin’ camp in days gone by and still drinks her liquor straight.